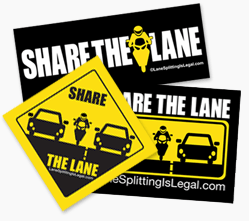 Lane Splitting Safety Tips: new guidelines, issued September 27th, 2018. These are the new tips from the CHP, thanks to AB 51, which replace the original lane splitting guidelines. CHP Lane Splitting Brochure: This brochure was distributed by the CHP to help publicize the lane splitting guidelines. In November 2017, the Bay Area Riders Forum released its own lane splitting / filtering / sharing guidelines, a more comprehensive set of recommendations for riders, by riders. Motorcycle Lane-splitting and Safety in California: 2015 release of OTS / SafeTREC study, with updated analysis of data from the California Enhanced Motorcycle Collision Data Project. 2014: Motorcycle Lane-Share Study Among California Motorcyclists and Drivers 2014 & Comparison to 2012 and 2013 Data – Third installment of the OTS lane sharing survey. 2013: Motorcycle Lane-Share Study Among California Motorcyclists and Drivers 2013 & Comparison to 2012 Data – Update to the original 2012 lane sharing survey. Click through for analysis, data tables and full survey PDF. OTS / SafeTREC study: Safety Implications of Lane-splitting Among California Motorcyclists Involved in Collisions – by Thomas Rice and Lara Troszak. This study summarizes an analysis of preliminary data from the California Enhanced Motorcycle Collision Data Project. Commuting by Motorcycle Impact Analysis (PDF) : Belgian study from 2012, assessing the benefits of motorcycle commuters for all drivers and traffic. Lane Splitting on California Freeways (PDF): excellent study of lane splitting in California by James Ouellet, who worked on the Hurt Report. Lane Sharing as a Motorcycle Safety Practice; A Further Evaluation: another paper by Steve Guderian, a follow-up to Lane Sharing: A Global Solution for Motorcycle Safety. Motorcycle Industry Council Position on Lane Splitting (PDF): Official position statement in support of lane splitting issued by the MIC in 2011. “In full consideration of the risks and benefits of lane splitting, the Motorcycle Industry Council supports state laws that allow lane splitting under reasonable restrictions.” Includes lane splitting guidelines that are similar to the CHP guidelines, although less specific and a bit more lenient. State motorcycle laws: comprehensive AMA resource page with motorcycle laws – including lane splitting – by state. Includes on- and off-road information. Pro-splitting articles in American Motorcyclist magazine: the fine folks at the AMA have provided us PDFs of some great articles in the members-only AMA mag. LaneShare.org: “A grass-roots collaborative effort by motorcyclists and motorcycle safety professionals to promote lanesharing.” Lots of great information. Old CityBike article from 1997, “Lane Splitting 101” reproduced on a website that looks to be from about the same time. Have a link that should be here? Please send it in and we’ll add it.